Harley Manifold was born in Camperdown, Victoria in 1982. In 2003 he completed a Bachelor of Fine Arts at Deakin University in Warrnambool. He then went onto complete his Honours in Fine Arts at the Victorian College of the Arts in Melbourne as the only non – previous student in his year. He has been included in numerous Art prizes and group exhibitions. 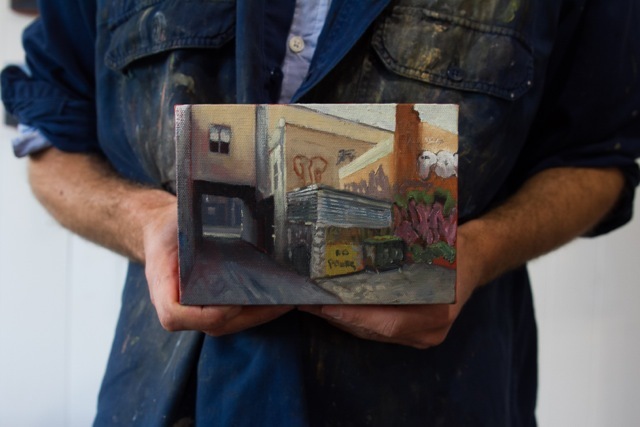 On three occasions he has been a finalist in Australia’s richest art prize for emerging artists, The Metro Art Award, and consecutively for the previous two prizes. Also a finalist in the Doug Moran National Portrait Prize (2015) and the Salon Des Refuses of the Archibald Prize (2016). Manifold’s works are in numerous private collections in Australia, as well as France and America. He has held numerous solo exhibitions in Melbourne, as well as shows in Perth and Adelaide and has recently been collected into the private collections of the Director of the Warrnambool Art Gallery, The Assistant Director of the National Gallery of Australia and the Director of the National Portrait Gallery of Australia. Harley will be doing a live painting of Melbourne city scape en plein air from 7pm. We will also have some drawing boards and materials in the gallery free for people to use if they’d like to join in and try a drawing !